Ant-Man and the Wasp buzzed its way to the top of the box office this weekend with an estimated gross of $76 million, which while at the lower end of expectations marks a big improvement over the first Ant-Man‘s $57.2 million opening. Meanwhile, The First Purge debuted reasonably well, giving Universal another successful entry in their ongoing action-horror franchise. Going forward, Dwayne Johnson stars in a blockbuster disaster/rescue flick, "Skyscraper," which recalls portions of "The Towering Inferno." 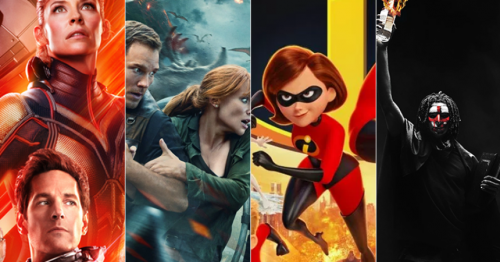 Boxoffice observed that social media has been "stalling," so the opening week prospects have been pulled back from a high of $50 to now $30 to $45 million. That means, the third installment of Transylvania comedy --- Hotel Transylvania 3 Summer Vacation --- a family friendly horror spoof will likely out draw Skyscraper with a $45 million projection. Denzel Washington's "Equalizer 2" debuts July 20. Media observations have it trickling upward ($22-$32 million) . Mama Mia Here We Go Again likely will surpass as buzz puts it in a $33 million opening weekend. Rounding out the "big" summer blockbusters, Tom Cruise will sneak in his latest Mission Impossible: FALLOUT on July 27. Facebook has accumulated over 3.4 million "likes" and the trade publication observers have it in the opening week $67 million range. Facebook has Mama Mia at 2.9 million likes and Ant Man Wasp at about 1.5 million likes. Among upcoming features Disney's Christopher Robin 123,365, Skyscraper 68,341 and Spy Who Dumped Me 28,757 likes are the top tallies according to the Boxoffice Facebook Forecast and the pub's own Long Range Forecasts.